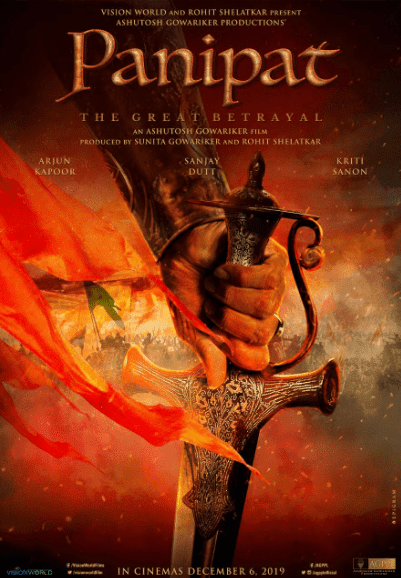 Panipat Release Date, Star Cast and Get also story plot of Panipat film, It is an upcoming Bollywood historical drama film which is being directed by Ashutosh Gowarikar. The film is produced by Sunita Gowariker and Rohit Shelatkar under the banner of Ashutosh Gowariker. Arjun Kapoor, Sanjay Dutt and Kriti Sanon are in lead roles. Ajay Atul is composing the music for the film. The songs will be written by Javed Akhtar. The film is set to be released on 6 December 2019. Here we shared all the latest information about Panipat movie star cast, details and much more about the film. Panipat film story revolves around the third battle of Panipat, which was fought between Marathas and Ahmad Shah Abdali’s army in 1761. Sanjay Dutt is portraying the character of Ahmad Shah Abdali and Arjun as Sadashiv Rao Bhau. The first teaser poster, the look was released on 15 March 2018. The film is slated to release on 6 December 2019. Sanjay Dutt, Arjun Kapoor and Kriti Sanon are playing the main lead role, Both Sanjay and Arjun first time working together. It is set to release on 6 December 2019. Ashutosh Gowarikar is known for making a period drama film. Some of his films include Lagaan and Jodhaa Akbar, Swades, Unfortunately, his last released film Mohenjo Daro was unable to deliver at the box office. Now He is making Panipat movie with Sanjay Dutt and Arjun Kapoor. The film is expected to hit screens December 6, this year.